TIFFANY WAS ADOPTED JUNE 16, 2008! We saw Tiffany in the shelter while she was on stray hold. She was shaking uncontrollably and the shelter staff said she would not eat. She was filthy, her hair matted and overgrown and underneath all of that, painfully thin. Her nails were incredibly long and her teeth were very dirty. (The third picture was taken at the shelter.) We promised to take her into foster care as soon as a spot opened up the following week. A few days later we were back at the shelter and Tiffany was still shaking and still not eating. A foster spot had not opened up yet but we just had to squeeze Tiffany in and get her back on track. The minute she left the shelter, she stopped shaking. She ate well for us and is eating three times a day to put on some weight. Tiffany is about 4 years old and weighs 7 pounds. She is the sweetest tiny little thing who is happy to be carried around, sit in a lap or snuggle up for a nap. She gets along very well with other dogs and with cats. She sleeps in a crate at night. At first she was not pleased with those accommodations and would protest loudly for the first few minutes. But after only two nights, she now immediately curls up and is down for the night as soon as she is put in her crate. We are sure she would happily sleep in a human bed but we will leave that up to her new family. 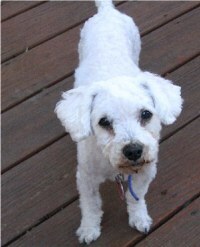 Tiffany has not had any accidents in her foster home where she is let outdoors frequently throughout the day. Tiffany has been professionally groomed but only after we had an unprofessional go at her with the clippers. 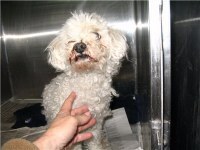 It was a Saturday night when we took her in and no way could we let her be filthy and matted for one more minute. We didn’t leave much for the groomer to work with (in our defense, there were A LOT of mats and burrs needing to be cut out), but as always, Reigning Cats and Dogs in Westfield, NJ, did a fantastic job with transforming our botched attempt at grooming. Please keep in mind that this breed of dog requires professional grooming every 6-8 weeks. The reason we see so many in such horrid condition is because people acquire them and then don’t want to spend the money for maintenance. 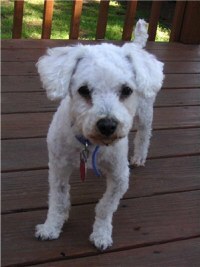 Grooming is a NECESSITY, not an option, with poodles! Tiffany tested heartworm negative, has had her shots and will be spayed and have her teeth cleaned on June 23, after which time she will be ready for adoption. She does have bilateral luxating patellas (the knee cap moves out of its normal location in both knees) but it is a Grade I, which does not bother her and does not require surgery. This is most likely inherited since she has it in both knees and it is a condition that is quite common in small breed dogs. We are currently accepting applications for adoption from New Jersey residents only, please. Homes with young children will not be appropriate for her as Tiffany is too petite and fragile.